We Ship from New Jersey - U.S.A.Barfi! 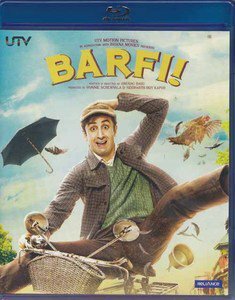 Hindi Blu RayWith English Subtitles, Making Barfi, Behind The scens, Deleted Scenes*Ing: Ranbir Kapoor, Priyanka Chopra, Ileana D'Cruz, Rupa GangulyRanbir Kapoor and Anurag Basu are back with yet another blockbuster movie. Anurag Basu has extracted life time best performances from Ranbir Kapoor and Priyanka Chopra. The vastness in expressions and maturity in acting shown by both of them is commendable. Barfi has already been nominated for Oscars and the chances of winning it are highly likely. Anurag Basu has always given mature movies with relevant subjects such as Life in a metro, Murder, and Kites.The story unfolds through a series of flashbacks and has three distinct timelines.1972Murphy "Barfi" Johnson (Ranbir Kapoor) was born deaf-mute and lost his mother as a baby, his father raised him alone, working as a chauffeur in Darjeeling. Barfi meets Shruti Ghosh (Ileana D'Cruz) who has just arrived in the city and is engaged to be married in three month's time and is immediately smitten. He wins her heart but Shruti is dissuaded from pursuing him by her mother. Shruti gets married and moves to Kolkata. Meanwhile, Barfi's father falls ill and he must raise the money for his treatment. After an unsuccessful attempt to rob a local bank, he attempts to kidnap his childhood friend, Jhilmil Chatterjee (Priyanka Chopra), the autistic grand-daughter of a wealthy man who passed away leaving all his money to a trust in her name, with her parents on salary; in order to hold her for ransom, however he finds her already kidnapped. Sneaking aboard a van he spots her in, Barfi drives Jhilmil away from the real ransom delivery and hides her in his apartment with the police in pursuit of them. Barfi collects the ransom but finds that his father has passed away as he makes the payment. Dejected, he tries to leave Jhilmil at the village of her caretaker but she refuses to leave him and they soon move to Kolkata.1978Barfi happens to meet Shruti again. She is unhappy with her marriage and they rekindle their friendship much to the chagrin of the lovestruck Jhilmil who then goes missing. Shruti files a missing persons report for Jhilmil. The Darjeeling police learn about the report and resume their pursuit of Barfi and arrest him. As he is interrogated another ransom demand for Jhilmil is made and she is apparently killed in the process of the exchange though her body is never found. In order to wrap up the case, the police attempt to frame Barfi for the murder. The investigating officer (Saurabh Shukla) who had been pursing Barfi all these years takes pity on him and asks Shruti to take him away, offering him a second chance at life, to which she agrees hoping to be with her true love. Barfi is deeply affected by Jhilmil's loss and finds living with Shruti unfulfilling. He deduces the location of the home where Jhilmil had spent her childhood and takes Shruti to go look for her. It is revealed that Jhilmil is alive, both kidnappings having been fabricated as a means for her father to embezzle money from the trust fund in her name, though the second time they fake her death so that she may return to her special care home, away from the clutches of her alcoholic mother. Barfi is re-united with Jhilmil and they marry while Shruti spends the rest of her days alone, regretting having lost her opportunity to be with Barfi when she could have. Puja Bajot/ Chaurang/ Chowki (Hindu Pooja) - Silver Design 18" X 18" X 5"